Within minutes of Rick Scott's announcement Monday that he will challenge Sen. Bill Nelson, Democrats were swarming like ants on a jelly sandwich. As expected. Dems have been anticipating the Florida governor's move for months, preparing thunderous criticism to mark the moment, noting everything from Scott having been previously forced out as chief executive of Columbia/HCA amid a federal fraud investigation to his "long history" of siding with the gun lobby. But what was conspicuously missing in the Democrats' first campaign cannon-fire was anything to give voters a reason to return Nelson to a fourth, six-year term at age 76. Press release messages were weighted heavily on the side of bad-Rick Scott, not good-Bill Nelson. "That's because Bill hasn't done anything to distinguish himself or his state," said Gordon Fleil, a Washington-based GOP consultant. "It appears the Democrats' strategy is going to be, 'Look at the man with the record so you don't see the incumbent doesn't have one.'" The Republican Party of Florida on Monday launched NoMoreNelson.org to highlight that after nearly 30 years in Congress, Bill Nelson has sponsored 860 pieces of legislation, and only 10 have been signed into law. "His mediocre ascension through the political ranks has produced no noteworthy accomplishments," says RPOF, "but instead has left behind a trail of high taxes and lost jobs. Bill Nelson has failed to do his only job -- represent Floridians in Washington, D.C."
Republicans elaborate: Three of the 10 pieces of legislation Nelson sponsored were during his time in the U.S. House of Representatives. Nelson's 10-item "career accomplishment," they say, has cost an estimated $4.4 million in taxpayer-funded government salary over the course of his political career. But what Nelson may lack on his invisible record and below-par (49 percent) name recognition, he makes up on energized opposition in Florida to President Donald Trump's perceived policies on guns, minorities, immigrants, and women. On the other hand, Scott's approval rating as governor -- at 58 percent in February -- and a growing economy have given his campaign a strong foundation. Under his leadership, taxes have been cut by more than $10 billion, businesses have created nearly 1.5 million new jobs, and record investments have been made in Florida’s education system, transportation infrastructure, and environment. That's the kind of message the GOP is getting out to counter Democrats' Monday media blitz. Plus, it doesn't count the willingness Scott has shown to sink his own millions into a campaign. Remember, between 2010 and 2014, he pumped $83 million into his two races. That's what the Dems are up against. 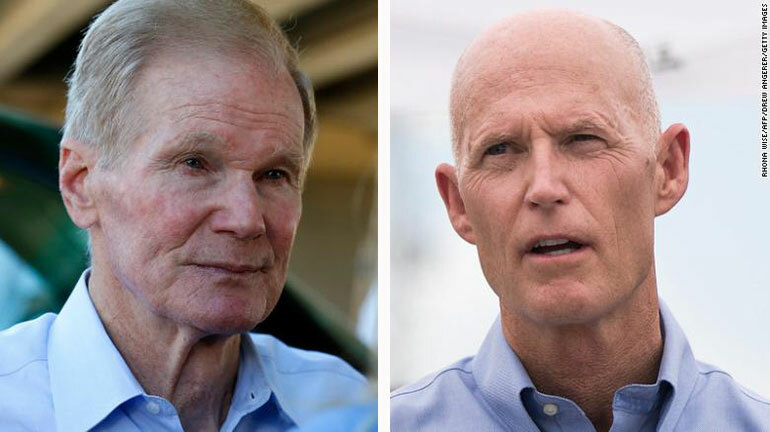 Every pundit and political observer on network news Monday predicted a close, bloody and costly -- as much as $115 million costly -- Senate race in Florida. The anticipated expense is the part that cuts Democrats like a knife. As CNN reported Monday, because the blue team will have to direct ungodly sums of money to the Sunshine State to try to hold on to Nelson's seat, they will have less money for potentially winable races in states like Arizona, Nevada or Tennessee. Says CNN, "Senate Democrats have lots and lots of vulnerable incumbents up in November. There are 10 Democratic incumbents who hold seats that Trump won in 2016 -- including five he won by double digits. Defending all 10 of those incumbents was going to be a costly proposition before Scott's candidacy; it just got much more expensive." Hence, the importance of the early Democratic start, putting immediate pressure on Scott with caustic reaction to his campaign announcement and diverting attention away from Nelson's weaknesses. -- Congressman Ted Deutch, D-Florida: "It was 612 days between Pulse and Parkland and Rick Scott did nothing to address gun violence. ... Floridians can't trust Scott to look out for anyone but himself -- and they can't afford another 6 years of his leadership." -- Congresswoman Lois Frankel, D-Florida: "Rick Scott is Donald Trump’s handpicked candidate to represent Florida. Losing this seat will be a major blow to Democrats trying to turn the Senate blue. ... (He) has already poured millions of dollars into ads, so we know he’s willing to spend as much as possible to buy this seat." -- Florida Democratic Party Chair Terrie Rizzo: "Here's his record: lost jobs, low wages and an economy that works for himself and his political donors, not to mention higher healthcare bills, a broken public education system and scandal after scandal. There is no limit to Rick Scott's dishonesty ..."
Florida Democratic Party: “Governor Scott has regularly put the wishes of corporate polluters above the needs of Florida’s environment and families. He’s sided with a fringe movement of climate change deniers, defunded popular and bipartisan conservation programs, and undermined the enforcement of air, water, and climate protections. ..."
State Sen. Audrey Gibson, D-Jacksonville: "(Rick Scott's) latest slush fund scheme of doling out money has fallen short of long-term job creation with little to no reach deep into communities where unemployment and community development remains an issue." Dan Gelber, former state senator, now Miami Beach mayor: "Floridians will have the benefit of a clear-eyed view of a truly dismal record. Floridians won't forget the damage Rick Scott's self-serving politics have done these last seven years, no matter how he tries to change his spots and obscure his record." State Senate Minority Leader Oscar Braynon II, D-Miami Gardens: “Since the minute he was elected governor, Rick Scott has done nothing but look out for himself. One of his first actions as governor was rolling back the progress Florida had made in restoring voting rights for so many Floridians. ..."
St. Petersburg Mayor Rick Kriseman: “From cutting Florida’s public school funding -- driving our state to the bottom of the country in per-pupil funding -- to refusing the high speed rail funding that would have improved transportation and spurred economic development along the I-4 corridor, Rick Scott has done nothing but put himself ahead of what’s best for Floridians." CNN is already giving the statistical edge to Nelson to win. But that isn't likely to unnerve Rick Scott who has never known any other political position than underdog. In fact, the governor must be rubbing his hands right now, thinking ... I've got him right where I want him. Well now, somebody is challenging Grandpa so he will have to come up with an agenda and a cause real quick. I am sure the Florida Democratic Party will generate something for him to champion, like gender neutral bathrooms or something in every rest stop, or something equally momentous. Billy has been useless for 18 in the US Senate and also he is better suited as a member of a Shuffle Board Club instead of being a member of the US Senate. TERM LIMITS! Nelson has done nothing for Florida besides occupy a congressional seat. There has to be someone that can/will primary Scott,no way will I vote for Dumb or Dumber. Scott's association with Trump will end his political career. What a bunch of political hacks! Ted Deutch, Lois Frankel, Rizzo, and the rest of the clowns are so pathetically bankrupted in every area of their lives. FLORIDA IS A MAGNIFICENT STATE, WHERE PEOPLE OF ALL AGES ARE ENCOURAGED TO ACHIEVE. EDUCATION IS ENCOURAGED AMONG ALL AGES AND FLORIDIANS AS A RULE KEEP THE STATE NEAT AND CLEAN, AND THE MOST PRIME CONDITION. I LOVE AND MISS FLORIDA. I ABSOLUTELY HATE EVERYTHING ABOUT GEORGIA, WHERE I AM. IF YOU ARE 50 YEARS OLD AND OVER, YOU ARE TO BE PUT OUT IN THE PASTURE SOMEWHERE, AND AS SOON AS THEY BUILD SOMETHING, IT VERY SOON TURNS INTO A GHETTO. WE HAVE EVERY DISCRIMINATION KNOWN TO MANKIND. EVEN IF THE PERSON WHO IS INTERVIEWING YOU IS OBESE AND YOU ARE SLENDER, CHANCES ARE YOU CAN STILL BE DISCRIMINATED. FLORIDIANS BY AND LARGE DO ENCOURAGE GOOD HEALTH PRACTICES. DO NOT BECOME LIKE GEORGIA AND KEEP GOVERNOR RICK SCOTT!!!!!!!!!!!!!!!!!!!!!!!!!!!!!!!!!!!!!!!!!!!!!!!!!!!!!!!!!!!!!!!!!!!!!!!!!!!!!!!!!!!!!!!!!!!!!!!!!! Just as in "Julius Caesar's"
Just as in "Julius Caesar's" day, it's NOT guns NOR "buttstocks", but rather entrenched, corrupt, Democrat "assassins with knives" intent upon keeping (or retaining) political power at ANY and ALL cost. AHH.....And who has been in power for the past 8 years in Congress??? Speaking on entrenched, corrupt, only caring about the top 1%, yes, Republicans are 'asses with knives' and are certainly intent on keeping political power. Look who is the titular head of the Republicans, none other than the person who lies everyday about everything and anything: The Donald. #Not My President.